This grade indicates the overall difficulty of the climb. It takes into account the climbs length, its seriousness and the ease of approach and descent. II. One or two pitches, well-protected, fixed belays, descent on easy terrain, quick walk-in. Not particularly demanding nor dangerous. III. Multi-pitch climb that requires a couple of hours to climb or to walk-in (possibly with skis). Good knowledge of the winter mountain environment essential. No fixed belays. Descent usually via abseil down the route. IV. Long multi-pitch route in alpine environment. Good knowledge of the winter mountain environment essential. The walk-in may be prone to ice and/or stone falls, and/or avalanches. Difficult descent; abseils need to be rigged. V. Long, sustained and demanding multi-pitch route. Danger of rock/ice/avalanches, demanding descent. Few repeats. VI. Extremely long and isolated climb, difficult to repeat in just one day. Difficult approach and descent, and difficult to turn back once on the route. The hardest ice routes in the Alps and the world are currently accounted for in this grade. VII. As for No. VI, but harder still. There are few routes of this grade at present. This grade refers to the technical difficulties of the pitch and takes into account the angle of the ice-fall, whether the climbing is sustained or not, the nature of the falls formation, and the nature of its protection. 1. Easy angled ice that has no particularly hard sections. 2. Easily protected pitch on good ice. 3. Some 80º sections but on thick, compact ice, with comfortable, well-protected belays. 4. Sustained and near-vertical pitch, or a short pitch with a short, vertical section. Good ice and satisfactory gear. 5. Sustained and nearly always vertical pitch up discreet ice, or a less sustained pitch that is technically more demanding. Few rests. 6. Very sustained pitch that offers no rests at all. 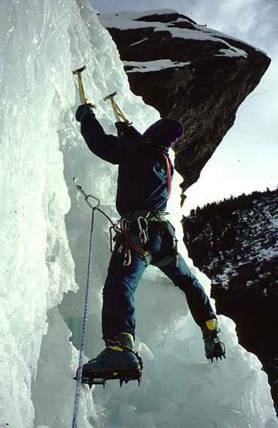 Difficult ice; some overlaps and other formations require good technique. Protection difficult to place and often of dubious nature. 7. Very sustained pitch that offers no rests at all. Extremely fragile and technically difficult ice. Protection run-out or non-existent. The letter "X" refers to particularly fragile formations, while "R" indicates thin ice. Over the last couple of years there has been a dramatic rise in ice-climbing standards; ice falls are being freed and the scale is shifting upwards rapidly. This has been brought about by the fact that previously unclimbed bands of rock are being overcome with the use of ice-axe and crampons, thereby linking various sections of ice. This is known as dry tooling and it has invariably brought with it a new grading system. The letter M indicates that the route is mixed (ie. ice and rock), and this is followed by a number which indicates the technical difficulties. At present the open-ended scale starts at M1 and finishes at M9.